In the accolades department, one of my pictures of Heber's #618 was chosen as best color photo at WinterRail: http://www.mikemassee.com/gallery/v/trains/heber/07-02-07_Heber_Valley_Railroad_locomotive_trestle_sunrise_0045_v02.jpg.html and a Nevada Northern Image was picked as a runner up in a contest at the Center for Railroad Photography and Art, and will be shown in an exhibition at the California State Railroad Museum in Sacramento beginning this month. http://www.railphoto-art.org/award2009/massee.html The competition was tough and there are some terrific photos there. 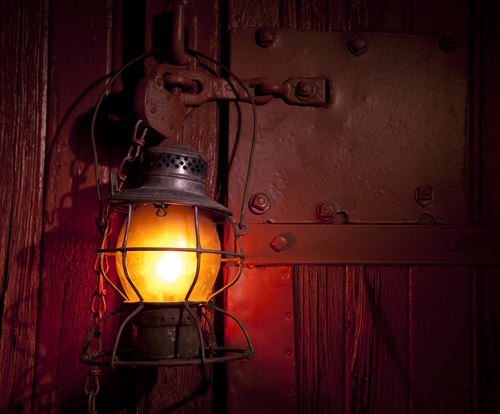 In the publications department, the Railroads Illustrated May issue features a cover story which is a Photo-Essay by Steve Crise and I about railroad lanterns. The Feburary issue of TRAINS magazine featured a photo of the newly restored Nevada Northern #93 as I documented its return to steam in late December. A lot of great photos came out of this year's winter freights. I took my first trip to a Colorado Railroad in February, to the Durango and Silverton. Many thanks to Tom Schultz for alerting me to the private Charter and Dave Gross for running it so well. http://www.youtube.com/watch?v=QlhY0J5-ftg&fmt=22 One camera does it all! Despite its natural beauty, Durango is a very challenging place to shoot stills in anything other than fresh snowfall due to the complexity of the scenery. But the railroad and right of way are just incredible, and the owner has a real passion for it. 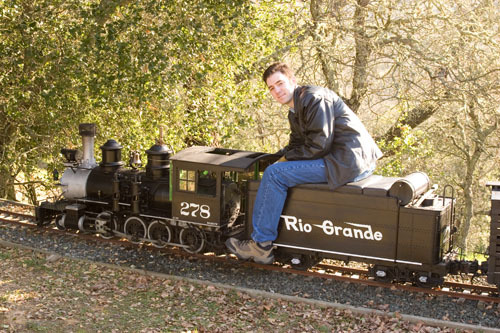 He plans to keep the railroad alive by building a much needed conference center in Durango, and using part of the profits to pay for the railroad, which like most steam railroads do not pay for themselves through ticket sales alone. Video was also shot and will be forthcoming. On the Live Steam front, I am in the middle of shooting an HD documentary about a wonderful backyard railroad in Portola Valley, the Flintridge and Portola Valley RR, run by Ron Schmidt, Peter Moseley and Bill Boller. During the first shoot session I also took some photographs, which include some hyper-real locomotive night portraits, and images of Bill Boller's 268 in "Bumblebee" colors - seeing steam for the first time. http://www.mikemassee.com/gallery/v/livesteam/flintridge_and_portola_valley_09/ Some more photos from an earlier visit are here: http://www.mikemassee.com/gallery/v/livesteam/FRPVJan08/ with yours truly at the controls of Peter's Consolidation. More night portraits will be forthcoming this year. Many thanks to the Pruitts for their incredible hospitality and generosity. There's some interesting stuff in the works for later this year and next winter, so stay tuned. I spent some time after Christmas documenting the steam trials for Nevada Northern ALCO Consolidation #93. I put together a video for the museum to promote and celebrate this. It is the first video I have uploaded to YouTube in HD, now that it is available. I must say the quality is finally very good. Since I don't have my embedded 'video gallery' on this site finished per se, I'll just link straight to the YouTube page. It was a very good weekend overall. Pretty well done piece on the new space industry in Mojave, including XCOR. This was shot just a couple of weeks ago. This is a soft launch, there's still some things missing and bugs to work out, but the fact that I've gotten it to a largely complete state is pretty amazing. There's nearly 3,000 photos in the gallery now, many of which have never been seen before. The biggest new addition is the complete travel gallery from Turkey, with many of that country's well known archeological and architectural treasures. The major photographic items left are the four Japan trips, the Britain trip and some miscellaneous and aerospace stuff. At the rate I have been photographing, it has been difficult to keep up with the backlog. I've hacked up the Moveable Type blog software to fit in my site template more or less, but later on it's going to need some cleaning up. I'm brute-forcing it's byzantine templating system rather than working with it currently. It does not play nice with existing site CSS files. So welcome back, and I'll be adding even more content in the coming months. I am nearly caught up with everything, which is good news. Enter your email here to receive a notice when there are new posts. your email will not be given out.